Media: Soft cardboard cover; 302mm x 226mm in portrait format; 96 pages plus covers; around 200 photographs; more than two dozen pieces of colour artwork - profiles and scrap views. Advantages: Interesting and varied selection of photographs, excellent reproduction of images, very informative text/captions, superb artwork, accomplished models. Some the best images of a particular subject are often found in aircraft scrap yards. Frequently these offer a much clearer view of details not normally seen in photographs of operational machines. Here we have a book that is predominately a collection of these “graveyard” snapshots. It’s primarily objective is to showcase to the reader the varied way in which camouflage and markings were applied to Luftwaffe aircraft. There are nearly 200 photographs contained within the 96 A4 sized pages. Most are in black and white but there are a few tasty images in colour. The lovely shot of a Bf109 G-6/AS with red undercarriage and wheel hubs is one such case. In a field such as this, there will always be photos that are familiar to the aficionado. Considering a book of this size, it is inevitable that it happens here. However, those duplicated images will surpass many seen in previous publications. This is due to the quality of reproduction and the large format of the printed picture. Thus the reader is able to see the maximum detail possible in each shot. Many similar publications concentrate on aircraft from only the latter years of the war. That’s not the case here. The battlefields covered range from the Spanish Civil War to the heart of Germany itself. As a result, the aircraft themselves are from varied and diverse roles. Apart from the expected assortment of day fighters, the book presents a smattering of bombers, trainers, ground attack, and night fighters. Each one is given an informative caption that describes both the machine and its finish. This is always going to be a controversial area but the author does an excellent job of stepping through a potential minefield to come to his conclusions. Tom Tullis is no stranger when it comes to illustrating aviation. His work has appeared in over 100 publications…and for good reason. The examples presented here consist of over two dozen graphical representations of either the aircraft and/or their details. 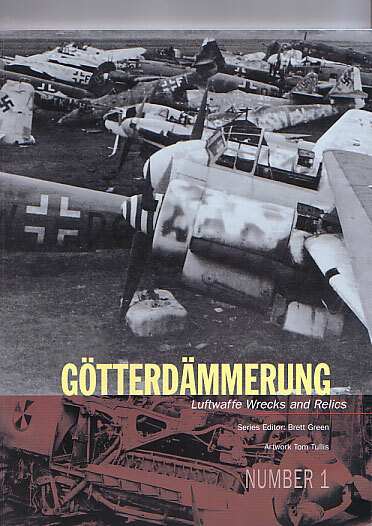 The final chapter is devoted to modeling the aircraft of Götterdämmerung…“the twilight of the gods”. The author has chosen the Me 262 for this edition: no doubt a personal favourite. Five different models are displayed, with each aircraft shown in full colour. The standard of each build is first-rate and will give inspiration to all enthusiasts. The kits selected range from the Dragon and Tamiya offerings in 1/48 to the sublime Trumpeter release in 1/32 scale. This book should provide plenty of stimulation for the Luftwaffe fan. Within its pages are interesting and varied selections of photographs that are well reproduced in a pleasingly large format. All this is complimented by some superb artwork, and along with the models, conveys what many of the aircraft would have looked like in their chosen livery. With an informative and revealing text, there is plenty to motivate the reader.